Old evidence on Henry Kissinger, former Secretary of State under presidents Richard Nixon and then Gerald Ford, and reputed to be heavily involved in numerous war crimes throughout his time government service, failed to win a single conviction in court for all of these atrocities. However, in Argentina’s so-called “Dirty War” against labor organizers, students, journalists, nuns, pacifists and other assorted dangerous terrorists, new evidence has arisen implicating Kissinger’s role in the United States supporting of the Buenos Aires regime in an effort in which at least 90,000 people that were disappeared, tortured and murdered. If this evidence is considered in a trial in court, it may enough to convict Kissinger of these war crimes in Argentina. Kurt Nimmo, Infowars.com, reports on this news story. Henry Kissinger, as Secretary of State, routinely facilitated mass murder. And yet, as a prized high level globalist and Rockefeller confidant, this criminal has remains untouched. Additional evidence has surfaced revealing Kissinger’s role in Argentina’s so-called “Dirty War” against labor organizers, students, journalists, nuns, pacifists and other assorted dangerous terrorists. The United States enthusiastically supported the regime in Buenos Aires while least 9,000 people were disappeared, tortured and murdered. It has been known since at least the 1980s that Kissinger was intimately involved in what happened in Argentina. “Just three months after Argentina’s generals took power in 1976, Secretary of State Henry Kissinger gave that country’s military a green light to continue its ‘dirty war,’ according to a State Department memorandum,” Martin Edwin Anderson wrote in 1987. “This document shows that in early 1977 Robert Hill, then the U.S. Ambassador to Buenos Aires, told a top Carter Administration official that Kissinger had given his approval to the repression in which at least 9,000 people were kidnapped and secretly murdered. Kissinger, he charged, put his imprimatur on the massive disappearances in a June 10, 1976, meeting in Santiago, Chile, with Argentina’s Foreign Minister,” Anderson writes. 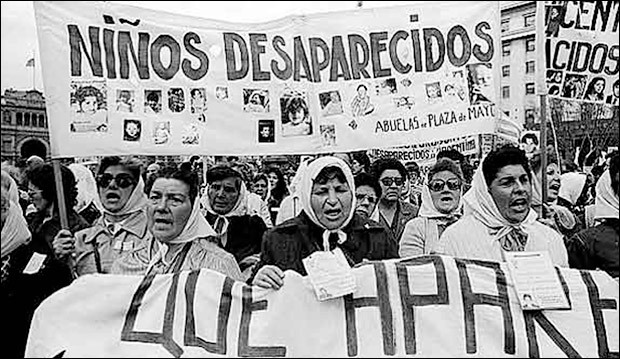 Argentina’s disappeared children from “Las Abuelas de la Plaza de Mayo.” Photo: Latin American and Latino Studies Program at Wake Forest University. While Kissinger’s role in rounding up and murdering the political enemies of the generals in Argentina is once again entering the spotlight, his handiwork in the slaughter of untold thousands in Cambodia remains largely a political footnote. Under Nixon’s operation Menu, facilitated by Kissinger during peace talks with North Vietnam, the U.S. military dropped an astounding 2,756,941 tons of bombs on the country, a destabilizing process that ultimately led to the rise of Pol Pot and the Khmer Rouge who viciously implemented a barbaric form of communism that resulted in the death of millions. Kissinger, as an “elder statesman” sheltered by his status as a high level globalist operative intimately connected to the Bilderberg Group and the Trilateral Commission, will, of course, never be arrested and sit in the docket accused of perpetuating war crimes. The elite are immune from prosecution and because of this they continue their work, often accomplished with unprecedented violence and brutality. Because he is untouchable and will never face justice, or even the wrath of his fellow citizens, who are largely ignorant of his crimes, Henry Kissinger is free to play a bit part in a comedy routine with Comedy Central host Stephen Colbert. Mass murder, genocide, napalmed babies, students thrown out of helicopters – the real legacy of Henry Kissinger and the ruling elite is not a subject discussed by Colbert or the Hollywood glitterati. Because most of us are blissfully unaware and lost in a haze or irrelevancies and mindless entertainment, the crimes will continue and Americans will angrily wonder why they are the most despised humans on the planet. Mr. Kissinger is shown in the video titled The New World Order. This is followed by the Trials of Henry Kissinger. Download this report by first moving your mouse over this link. Then depress the button on the mouse until the flow starts. Keiser Report – Pimping USA Bill Gates of Microsoft has been selected as the number one top person this year, the guy everyone thinks is the most likeable person the planet, provided by some news outfit. Really! How insensitive have the people of the world gotten? This is not of when Gates was at Microsoft but in the years that followed in his retirement. Plus, in the last half of the 30 minute video show, Max has a guest, as he usually does. New!